Northerntruthseeker: Israel DID 9-11: Jewish Reporter Uses Cartoon To Show Israel's Involvement In The 9/11 False Flag Attack! 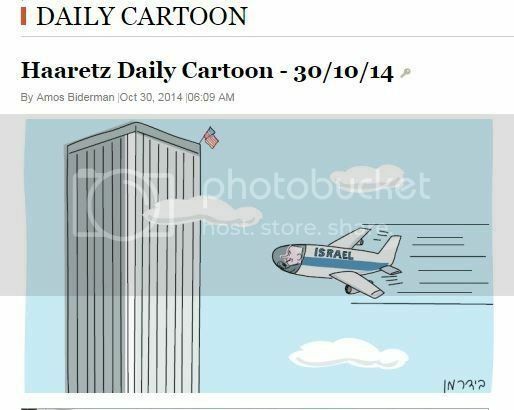 Israel DID 9-11: Jewish Reporter Uses Cartoon To Show Israel's Involvement In The 9/11 False Flag Attack! I imagine this cartoon, published in the Jew paper Haaretz, was good for belly laughs all over the Jewniverse, since truth sometimes is the best form of humor. But the cartoon is getting some heat, since it appears their are some in the lame-stream media that aren't completely dead and have taken umbrage at this honest depiction of Israel attacking the USA on 9/11. As most of the world now knows, Israel masterminded the 9/11 False Flag, with help from traitors in the WH, the Pentagon and the CIA, FBI and NSA. This 'cartoon' brings to the front what many already knew, and others are finding out daily, that not only wasIsrael behind the 9/11 False Flag, Israel is also America's most deadly enemy. TEL AVIV, Israel, Oct. 30 -- A political cartoon published Thursday by Hebrew daily Haaretz incited international controversy with its depiction of Prime Minister Benjamin Netanyahu piloting a plane labeled "Israel" toward a tower flying the American flag, intended to evoke the September 11, 2001 terrorist attacks on the World Trade Center. Amos Biderman, the artist who authored the comic, told The Times of Israel the image was intended to imply Netanyahu is leading the country to "a disaster in Israel-US relations on the scale of 9/11," pointing to the Prime Minister's "arrogance" and his handling of settlement construction in Jerusalem as poor diplomacy.If the cartoon had showed Ehud Barak, the real 9/11 pilot during that False Flag, it would be much more complete, but having the seriously deranged and violent Netanyahu there will do. Within minutes of the airplane crashes on 9-11, Ehud Barak (the founder and master of the Israeli military's covert operation force, the Sayeret Matkal) was in the London studio of the BBC World ready to provide a plausible (and political) explanation to the world. What does the Jew do to bring this revulsion of the Jew upon themselves? Children of holoHOAX survivors are now getting paid money from the corrupt "International Center for Holocaust Reparations." NTS Notes: This one is a prime example of the Jewish sick mentality…. These criminals know they have full control over our governments and media, and therefore can show the truth about their crimes with almost absolute impunity. Again this shows that they fully know who is responsible for the horrendous attacks on America on 9-11 and know the American public are basically powerless to expose or even try to stop them! It is a fact that what the Israelis see in their lying media is much different than what the rest of the world sees, and in a lot of cases their media actually does tell the truth knowing they can do so without any thought of retaliation from the rest of the world….